What is the difference between a coach and a psychotherapist? Which do you aspire to be?Let’s read on to learn the distinctions between the two roles. Psychotherapy focuses on what client wants to achieve in life now. Will address past in order to understand and remove its capacity to negatively affect progress. Works at pace tailored to suit client’s learning style. Coaching focuses on a person’s present. In order to help them create actionable strategies for achieving specific goals. The emphasis is on action and accountability. A coach may chase and check up on progress. Psychotherapy works on issues such as anxiety, depression, relationship, stress management, self-confidence, self-esteem, trauma, abuse, addiction, work issues. Coaching works on issues such as personal development, career development, business development executive coaching for individuals, teams or organisations, sports coaching. Psychotherapy excels in helping you build personal and psychological wellbeing and confidence, overcome blocks to success, particularly deep rooted blocks that coaches are not trained to address. Coaching excels in providing strategies and exercises that can help you clarify goals and steps needed to achieve them. Psychotherapy: the speed within change occurs depends on the complexity of the problem. Success can be achieved within 3 to 6 sessions on specific issues. More complex issues can take 12, 24 sessions or longer. Coaching aims to facilitate clients to achieve a change quickly because the problems it tackles are straightforward. Success can be achieved within 6 to 12 sessions, some clients work for years with a coach. Psychotherapists help clients clarify goals, understand blocks to achieving them, recognise how roots of unhelpful habits interfere with progress, provide/identify alternative strategies where useful. Coaches have a range of questions to help client understand blocks to success and develop strategies to move forward. 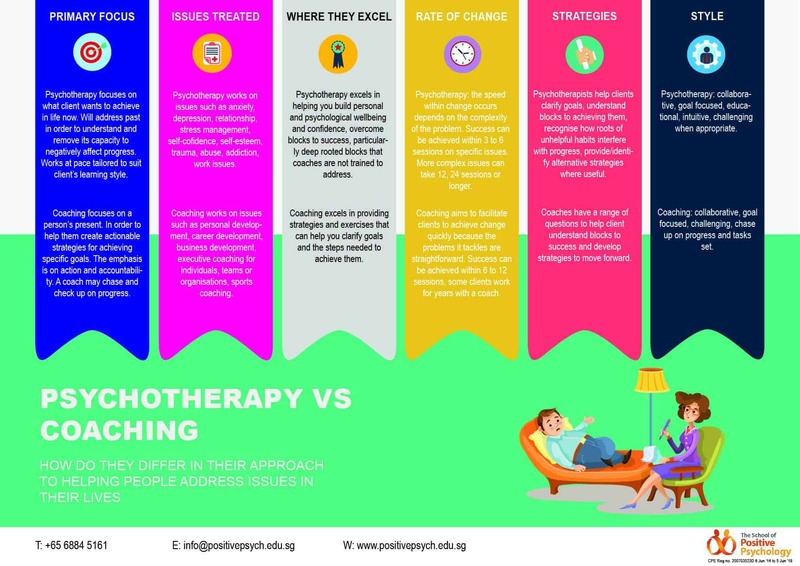 Regardless of the differences; both psychotherapist and coach aim to do help individuals to grow, master their problems, and become more effective in their lives. Do you see yourself as a therapist or coach in the near future? Contact us and find out how you can achieve your dream of becoming one!